West Chester, PA Hulafrog | Bouncetown Inc. HOURS: Mon - Fri 9:30am-12:30pm & Fri 5:00pm - 8:00pm, Sat mornings 9:00am - 10:00am. Check our website to see if any open plays are available during the weekend. Occasionally, we will hold open play sessions. 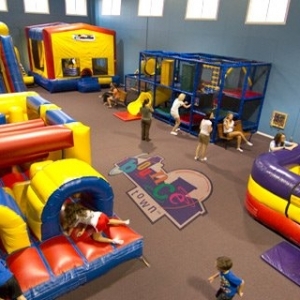 Bouncetown is a 10,000 square feet indoor fun center featuring giant inflatables and climbing structures. We specialize in supervised private parties, playdates, mom's groups, open play and special events. Open play is weekly Mon - Fri, Sat morn and some additional weekend times based on birthday party reservations. Please call ahead to confirm our weekend times. Birthday parties are Fri, Sat and Sun. Event space rental available for the entire facility or the lobby area. Kids as well as adults will love bouncing, sliding and climbing on our licensed equipment. Bouncetown has provided a clean, safe environment for your children of all ages.